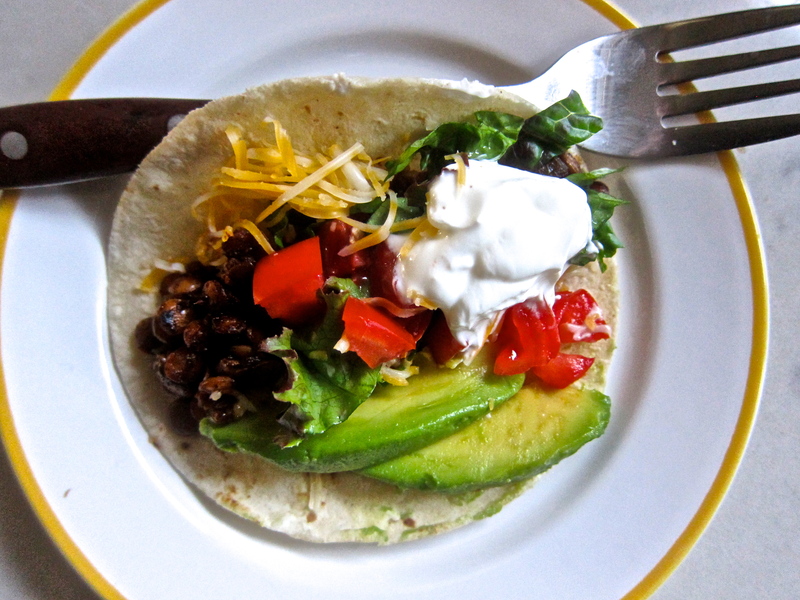 Hi all– If I had to eat one food every day for a month, I’m pretty sure I it would be tacos. So many bright flavors scooped up into a tender little tortilla– Yep, I could eat them pretty much every day. So here’s a new version to us– centered on savory lentils. I’m thinking these spicy, savory things could go a lot of places–mixed with couscous or rice, into a salad for dinner, worked into a dip… I think you may be seeing them again here. Pour the olive oil into a hot pan and add the onion. Stir and cook for 4 to 5 minutes, until the onion starts to brown. Add in the garlic and cook another minute. 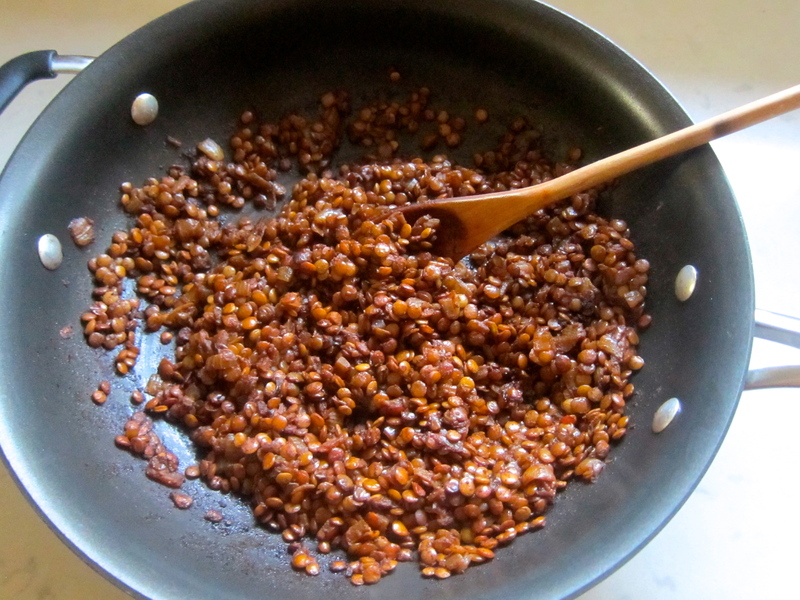 Then stir in the lentils and taco seasoning until it’s all blended. Add the chicken broth, water and chipotle and simmer for 25 to 30 minutes until the lentils are tender. Toast the the tortillas lightly and scoopy those hot lentils across the middle. Then layer all your favorite fixings. And eat! 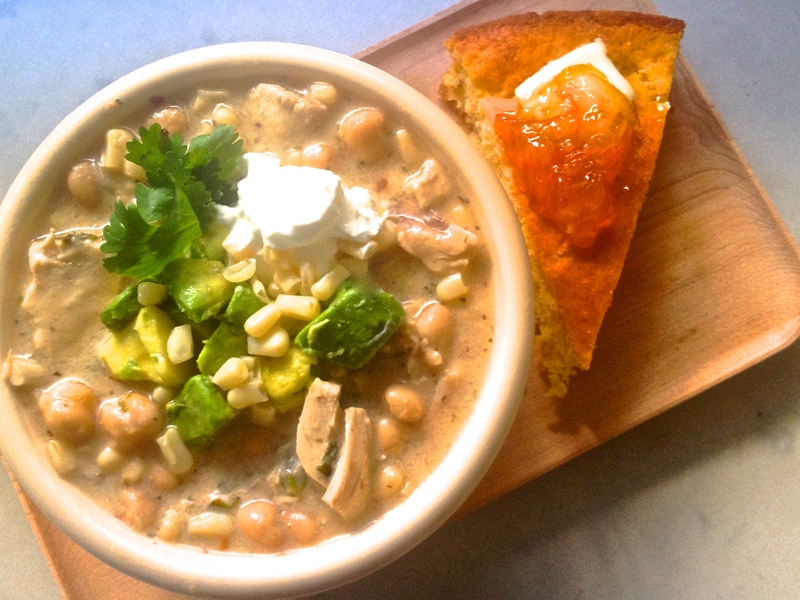 * Add more of less chipotle to meet your own person hot & spicy comfort level. 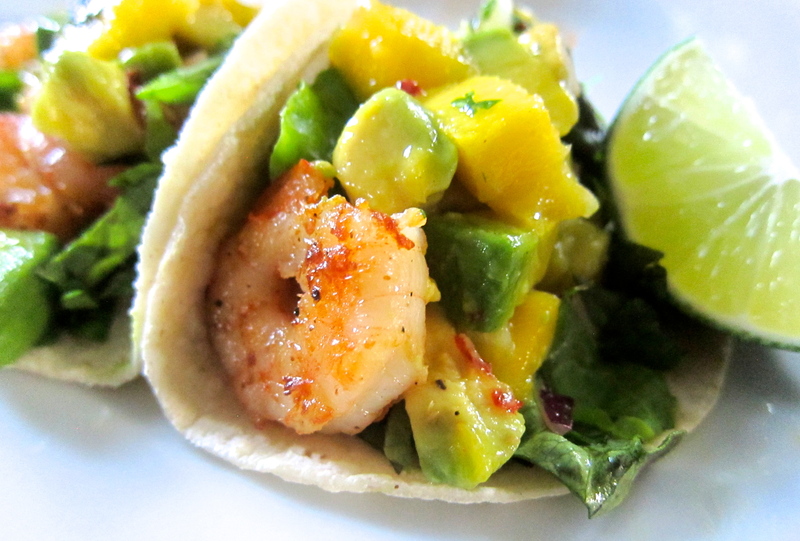 Hello there– If you’re the kind of person who loves fish tacos (and you can certainly put me in that group), then I think you’ll love this really easy shrimpy version with creamy, juicy mango salsa slathered on top. These were seriously good! Peel and devein the shrimp. Toss them in a bowl with the olive oil and a liberal sprinkling of salt and pepper. Then spread them separated on a cooking sheet sprayed with cooking spray. Slide them into a 450 degree oven for 10 minutes. They should come out salty, peppery crispy good. Then warm the tortillas just a minute in the toaster. Fill them with lettuce, shrimp and a squeeze of lime juice. Pile on the mango salsa and they are ready to eat. 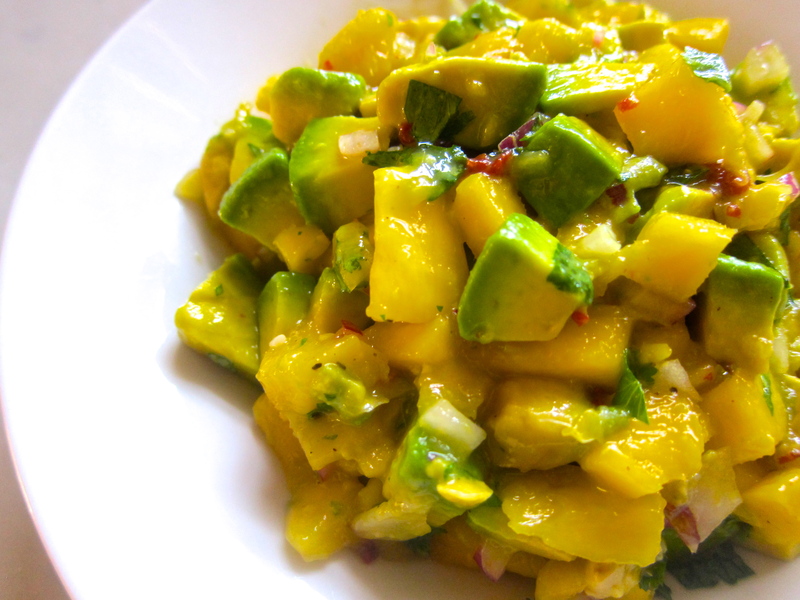 Carefully fold together the mango, avocado, onion, chipotle and lime juice. Salt and pepper and taste to see if you need a bit more seasoning. Delicious on tacos or just with a bowl full of chips! * The year we lived in Costa Rica, our little market sold small tender tortillas just wrapped in saran wrap and made by the ladies in the neighborhood–so fresh and tender. So I’m excited that I found the mini taqueria size tortillas at Stater Brothers if you live in Socal. Guerrero brand. **If you don’t like too much spice, just use half a chipotle pepper and be sure to scrape out the seeds and membranes before you mince it up. Hey there– Sitting out around the table under the backyard maple trees a couple nights ago, it was great to dig into this spicy, sweet, tangy plateful– with cilantro rice, a bright salad and a cold glass of “tinto de verano” (Spanish red wine and citrus soda). It’s an old favorite. I think you’d like it too. Filet the chicken breasts, cutting them horizontally to make 4 thinner filets. 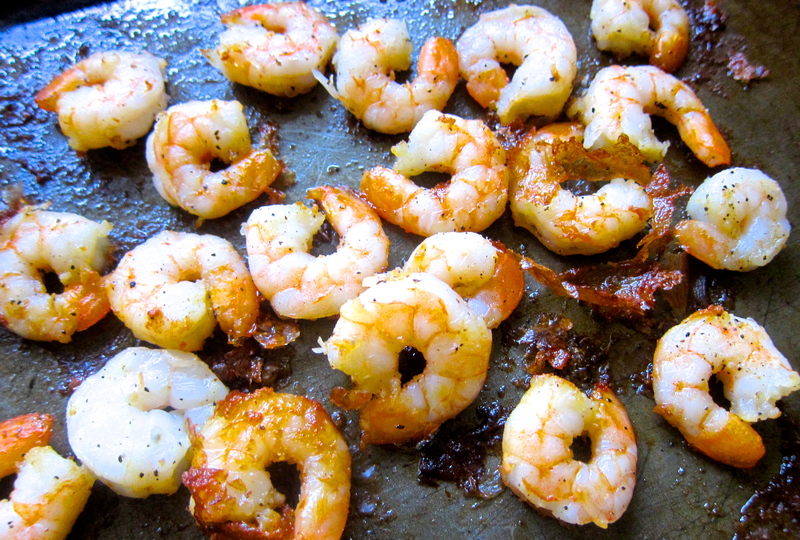 Cook them in the olive oil, 4 or 5 minutes on each side until they are nicely browned. Mix the marmalade and soy sauce and brush it on the chicken as it cooks. Take the chicken from the pan and cover it with foil on the serving plate. Save the green onions and almonds to garnish at the end. In the same chicken pan brown the onion in the butter over medium heat for about 3 minutes. Add the garlic and cook 1 minutes more. Stir in the orange juice, broth, soy sauce, brown sugar, chipotle and marmalade. Set the chicken unto the pan of sauce. Simmer for 6 minutes until the sauce thickens. Remove the chicken back to the platter. 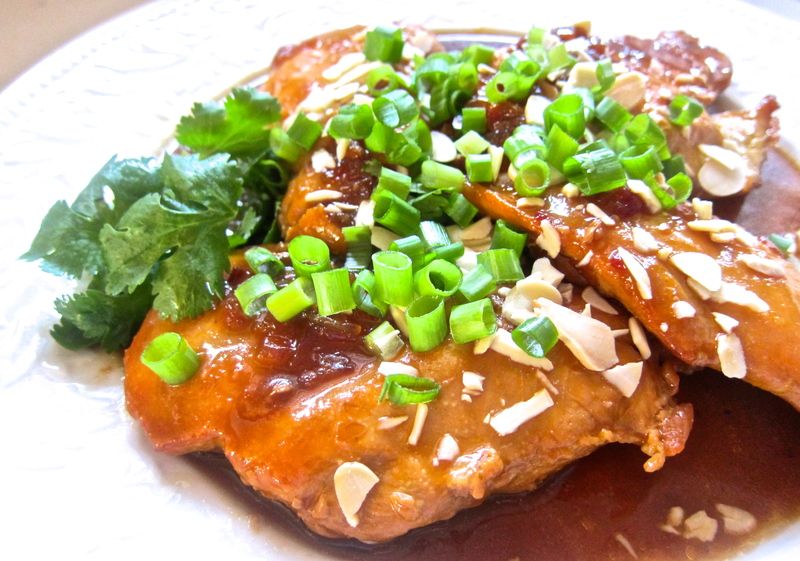 Pour the sauce over the top and garnish with the green onions and almonds. *If you don’t like things too, too spicy, you can used just half of a pepper– and I always scrape out the seeds so there’s not too much heat. Hello all– Is it still chilly where you live? Spring keeps trying to break through here, but this weekend looks rainy and cold. There’s sure to be some days left to put on the soup pot and crank up the fireplace. We had this chili at my buddy Betty’s house and I marched straight home and made up a potful for us. It was just as smokey good the second time around. Cook the little bits of bacon in your soup pot until their crispy. Remove them from the pot. Throw the onions in to cook until they start to brown. Add the garlic and cook a minute more. Then stir the chicken, paprika, cumin, chipotle and chili powder into the pot. Finally, add the chicken broth, tomatoes, beans and green chilis. Salt and pepper to taste. Simmer for 10 minutes or so. Stir in the cooked bacon and cilantro just before you serve it up. 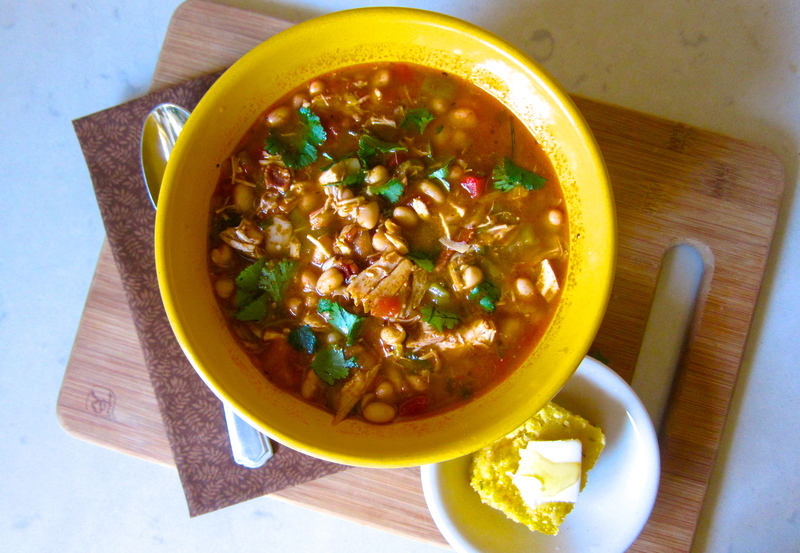 With rotisserie chicken, canned beans and canned tomatoes, you can stew this up in about 30 minutes. 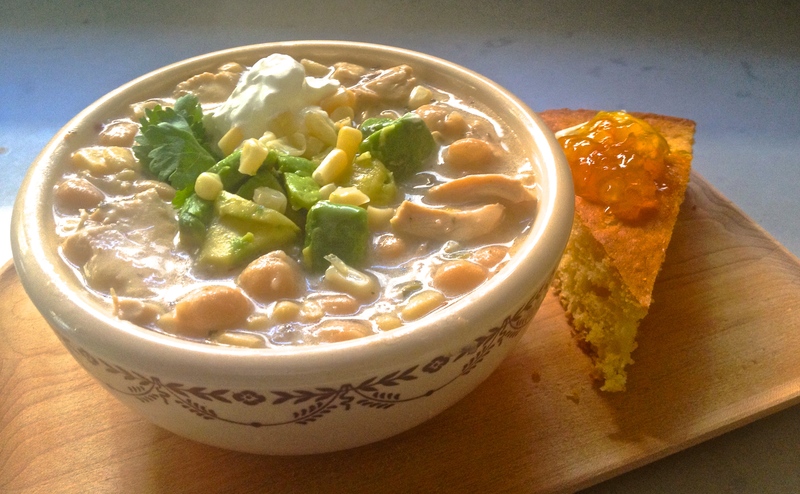 Drop a pan of cornbread in the oven and by the time it’s baked, this chili will be pretty much done. I do like quick.